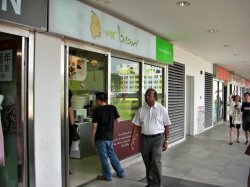 While waiting for my friend outside the MRT station, I went to buy a soya ice cream from Mr Bean to cool myself down in the hot weather. The price of the soya ice cream was $1.50 now. 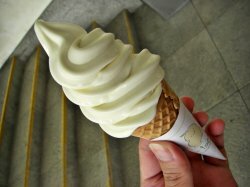 The orginal soya ice cream was in soft served type similar to McDonald's one. Though the taste was totally different. The taste was mild sweet with soya bean milk taste. I felt like eating frozen soya bean milk. The soya ice cream taste was also not oily, unlike those from McDonald's. Overall, this soya ice cream was delicious and I hope they sell in tub so that I could buy takeaway home to feast.